The 1-2-All is a facilitation technique that allows larger groups to generate questions, suggestions, and solutions all at the same time, making sure all participants have an opportunity to contribute. The meeting leader poses a question, then asks each participant to consider the answer silently on their own. The group then breaks into pairs to discuss the topic, and perhaps then foursomes. Finally, the discussion moves to the entire group. The 6 Fields of Distraction is a way to identify the things that keep us from paying attention to the task at hand, or get in the way of accomplishing the goals we set for ourselves. In a meeting, any participant struggling with one of the 6 fields of distraction will have a hard time fully committing their attention to the work of the group. A check-in is a technique used at the beginning of a meeting to give everyone an opportunity to speak, and during meeting transitions to survey the group's current status. The simplest check-in is simply to ask each person how they are. There are many more specific check-in techniques, each developed for a specific meeting context. Collaboration is a working practice whereby individuals work together to a common purpose to achieve a mutual goal or business benefit. Team meetings can be designed to encourage collaboration by providing opportunities for everyone to contribute to a shared result during the meeting. Poorly executed meetings, on the other hand, inhibit collaboration by emphasizing power dynamics, stifling discussion, and boring people. In a complex decision-making situation, there is no obviously correct choice. Instead, there are multiple answers that warrant further experimentation before committing to a single approach. A conference room is a dedicated space for events such as business conference calls and meetings. Convergent thinking is the opposite of divergent thinking. Instead of creating a lot of new ideas, convergent thinking works to focus in on the "right" idea. When a group makes a decision and outlines next steps, they are converging around a single idea. A criteria matrix is a valuable decision-making tool that is used to assess and rank a list of options based on specific criteria. For example, the simplest criteria matrix will compare the Pros and Cons of each option. Dialetical inquiry is a group decision-making technique that attempts to combat group think. The practice reportedly originated with Plato, who asked his students to consider both the thesis and antithesis to any idea. Groups using this technique divide into two camps: those advocating for an idea and those advocating against it. Both sides highlight the advantages of their assigned decision and outline the disadvantages of the opposing idea. In a meeting context, engagement describes the attention level of attendees and how much they participate in the meeting's activities. A participant's engagement is easiest to see when they are speaking or actively working in a group activity. People listening attentively may also be highly engaged. The term facilitator can refer to a person's profession or their role in a specific meeting. A fishbone diagram is a visual technique that teams use to organize their thinking and identify causes for a problem. The diagram starts with a process or problem written at the right center of the board, with a long horizontal line and an arrow leading to it. Then, diagonal lines are drawn connecting to the horizontal line, or spine, of the diagram. Each diagonal line represents a possible cause of the problem, or a set of inputs into the process. Someone decides that a meeting should happen with some group of people. Usually this results in someone scheduling a meeting. Meetings have a purpose. 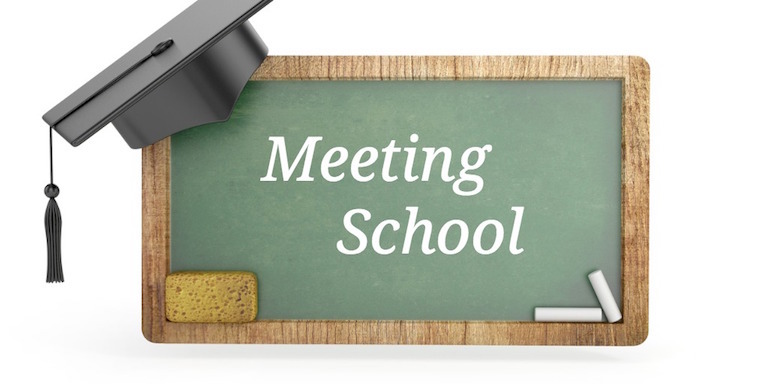 Meeting Costs are a calculation of the money and resources required to prepare for and run a meeting. Costs can be calculated by assessing software costs, organizational costs (people time), meeting productivity and efficiency, or a combination of all three. See our meeting cost calculators for more information. Meeting Metrics are data points, collected over time, that can show trends and patterns of efficiency or efficacy in your meetings. Common metrics include the number of meetings and participants, time spent in meetings, attendance, and meeting ratings. Meeting Minutes, or informally, notes, are the record of a meeting in written form. They typically describe the events of the meeting and may include an agenda, a list of attendees and no shows, a listing of issues and decisions made, and an action list with due dates and responsible parties. In formal meetings, the minutes become official after review and a vote at the next meeting. A Meeting Operating System is the system used by a company or organization to ensure meetings are effective and strategically aligned to the needs of the business. A meeting operating system establishes the performance criteria, operating models, and support all employees require to achieve effective business meetings. An organization's meeting operating system can be evaluated using the Meeting Performance Maturity Model, which describes five levels of performance maturity. The Meeting Performance Maturity Model (MPMM) provides a framework for understanding how well an organization’s meeting operating system performs and the degree to which an organization optimizes meetings to achieve their specified purpose. Groups operate at one of five levels of meeting performance maturity. A meeting scheduling tool that allows meeting organizers to ask attendees which days and times they are available to meet. A question posed to attendees during a meeting designed to increase engagement. Everyone answers at the same time, often using mobile polling applications or poll features built into web conferencing software. The meeting's purpose is a statement explaining why the group needs to meet, and why meeting would work better than chat or email in this situation. The meeting purpose should provide a clear line of sight to an end result in a meeting, preferably something that can be documented. Mind Mapping is a visual way to represent a central idea and related themes. The central idea is written in the center, and related ideas are placed surrounding the central idea with lines connecting them, like branches coming from a central trunk. Mind maps can be created on paper, a whiteboard, or by using mind mapping software. Mind maps have several uses in meetings. Multivoting is a technique used to take a long list of possible solutions and either narrow it to a smaller list by priority or reduce it to a final selection. Each person in the group gets a set number of votes, and ranks the options they prefer in order from most preferred (the high) to least preferred (the low). When all votes are cast, the votes for each option are tallied and will either reveal a clear winner or provide information for further discussion. Mute mapping is an affinity diagramming approach designed to encourage equal participation and reduce bias. Mute mapping follows brainstorming. When all the ideas have been added, the team works to organize the ideas into clusters of related ideas without speaking. The entire process must be completed in total silence. The groups are considered complete once every participant stops moving ideas around and signals their satisfaction with the groupings. Neutrality is often considered a desirable trait for meeting facilitators, who seek to stay unbiased about the meeting content and the outcome of any decisions. A neutral facilitator pays attention to the meeting process and seeks to ensure everyone has an opportunity to contribute to the discussion but does not work to influence the decision in favor of one option or another. Meeting norms are the standards of behavior expected from those in a team and during a meeting. Unlike a working team agreement, which covers the tools and processes a team will use when working together, norms primarily express the group's values. This includes topics such as how people take turns speaking, how to handle conflict, and expectations about meeting preparation. Meeting norms are also known as ground rules. RAID stands for Risks, Assumptions, Issues, and Dependencies. Teams may conduct a RAID analysis as part of their project planning meeting, then produce a RAID board which they can review, update, and revisit during project status meetings. The real-time agenda is a process for co-creating, prioritizing and discussing a list of topics in real time. Remote work is an arrangement in which employees do not commute or travel (e.g. by bus or car) to a central place of work, such as an office building, warehouse or store. Instead, they work from home or from another location outside the main office. Repeatability generally refers to the ease in which something can be done over and over. In a meeting context, implementing a similar process from meeting to meeting can increase the reliability of outcomes. Repeatability in achieving the desired meeting outcomes is one sign of meeting performance maturity. A retrospective is a meeting that's held at the end of an iteration in Agile software development or at the completion of a project. During the retrospective, the team reflects on what happened in the iteration and identifies actions for improvement going forward. Formal meetings, such as board meetings, may have people participating as: the Chair, the Secretary, Voting Members, Non-Voting Member participants, Guest Presenters, and Observers. A round robin is a technique in which everyone takes a turn generating and developing ideas in a group. The process relies on each team member building off previous contributions and can be conducted in either a verbal or written format. See also "Go-Around". Secretary is one of the defined roles in a formal meeting. The secretary’s role is to be the guardian of the process of meetings and the maintainer of the official business records. He or she often manages communication before meetings and keeps formal records of the group’s process and decisions: the minutes of the meeting. A Sensemaking Meeting is used to find answers to questions and improve shared group understanding of a topic or situation. You can find an introduction to Team Cadence Meetings in Chapter 29 of our book, Where the Action Is. You may also want to visit the Learn More link, below, for resources to help you plan, run, and troubleshoot the specific meetings your team needs. A silent brainstorm is a technique for generating ideas while everyone remains quiet. This allows participants to think without distractions or influence from other members of the group, and helps combat problems with groupthink and social loafing common to traditional brainstorming sessions. A group brainstorms ideas or responses, which are shared one at a time and posted to a shared space. The group clusters the ideas by related themes or concepts. The group names each of the clusters. The group reflects on what they now see. Social loafing is a term used by social psychologists to describe how some people contribute less when they work in a group than they would otherwise. When working in a group, some believe that their effort is not required since the other members of the group are taking care of the work at hand. A speaker queue is an online tool that allows meeting attendees to request to speak by virtually “raising their hand" and get into a queue. They are each subsequently given the floor to speak or present without distraction from others. A meeting storyboard is a document containing a multi-column table used by organizers and facilitators to design the content flow for a meeting. The left column lists the key messages. The right column includes the slides or other visuals to be shown for each message. Additional columns can be added to capture timing or other details. A SWOT Analysis is an analysis of a group's Strengths, Weaknesses, Opportunities, and Threats. A SWOT analysis may be conducted as part of an Environmental Scan in preparation for strategic planning. Strengths and weaknesses are usually internal, while opportunities and threats concern factors outside of your organization. The SWOT analysis includes steps for brainstorming, grouping, and prioritizing ideas in each category. The term Vegas Rules comes from the saying "What happens in Vegas, stays in Vegas." When used in a meeting, the rule says that whatever is said in the meeting must be kept private to the people who were in the room and should never be repeated to others. A virtual meeting is a real meeting held over the phone or the Internet involving one or more people who are not in the same location. The vote-discuss-revote technique helps a group understand differences and discuss them to achieve consensus. Unlike single-round voting, this technique gives everyone an opportunity to advocate for an option they feel strongly about, and for others to change their mind after learning more from others.